The kit LIFMA-neo-TSH is intended for evaluation of thyroid-stimulating hormone in dry blood stains ofneonates for neonatal screening of hypothyroid infantilism. Detection of neonates with primary hypothyroidism is based on the use of the TSH threshold concentration value. TSH concentration exceeding the threshold value indicates the pathology which requires extra laboratory testing. For making the diagnosis more precise TSH and N4 concentrations should be evaluated in blood serum. as option II - for assay of 900 unknown samoles in monoplicates, 18 calibration and 12 control samples in duplicates. The kit LIFMA-PPAB-A is intended for evaluation of concentration of protein-A of plasma (PPAB-A) in blood serum of human beings associated with pregnancy by means of lanthanide immunofluorescent assay. PPAB-A evaluation in blood sarum of human beings is used for monitoring of pregnancy, prenatalscreening during the first trimester aimed at detection of high risk pregnancy with in-born fetus diseases (syndrome Down, Syndrome Edward). PPAB-A measurement may be used as a biochemical test along with concentration measurement of free beta-subunit choriogonotropic hormone and results of ultrasonic testing during prenatal detection of high risk pregnancy. Yhe EIA-PPAB-A kit is designed for analysis in duplicates of 40 unknown samples, 6 calibration samples and 2 control samples in duplicates - total 96 evaluations. 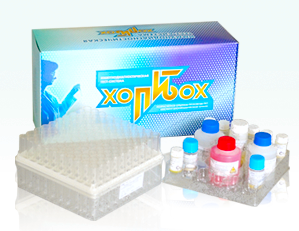 The kit LIFMA-free beta CGH is intended for evaluation of concentration of free beta subunit of chorionic gonadotropin in blood serum of human beingsby means of lanthanide immunofluorescent assay. Evaluation of free beta-CGH in blood serum of human beings is used for monitoring of pregnancy, prenatal screening during the first trimester aimed at detection of high risk pregnancy with in-born fetus diseases (syndrome Down, syndrome Edward), diagnostics and monitoring of some oncological diseases. Evaluation of free beta-CGH along with concentration of PPAB-A (associated with pregnancy of plasma protein A), the age of a pregnant women and the results of ultrasonic testing may be used for assessment of the risk of inborn fetus anomalies. The kit of EIA-free beta-CGH is designed for analysis in duplicatesf 40 unknown samples, 6 calibration samples and 2 control samples in duplicates - total 96 evaluations.